The first analysis revealed the top 10 destinations by searches, and top 10 by exits, which are shown in the rankings below. From this, two key insights are surfaced. Firstly, the majority (90%) of the top 10 destinations are within the EMEA region. This highlights the inclination for users within this region to travel closer to home, rather than going further afield. Secondly, there is a substantial mismatch between the ranks of countries by search and by exit. In fact, 70% of the countries in the top 10 destinations have a different search ranking to their exit rank – the only exceptions being Spain and the United Kingdom. In some cases, such as Italy, the intent is not matched by the action in terms of rank. In other cases, such as Greece, strong search to exit ratios bring the country up the ranks when looking at exits. Using the analysis looking at the year-on-year growth of searches and exits, we can start to predict how overall travel rankings might change in the future. For example, there are high search growth rates in Morocco, but this interest is not matched by a growth in exits. Whereas other destinations, such as Portugal, the Netherlands, Poland and Greece are seeing growth for both searches and exits. Given the popularity of travel to destinations within the region, these trending locations are not too surprising, and indicate that the preference to not go too far afield will be maintained in the future. The popularity of closer destinations shifts somewhat when we move onto the third analysis, which looks at the most popular long-stay destinations. The United States takes the number 1 spot, an improvement from being ranked 6 for travel from Europe and the Middle East on the whole. Additionally, India and Indonesia enter the top 10 and Thailand goes from being ranked 10th (by exits), to 2nd. This clearly demonstrates that for longer getaways, EMEA users are keen to discover destinations further afield. This same willingness to travel further is highlighted in the long-stay destinations that are experiencing the most growth: 66% of which are in Asia. There may also be an economic component to this trend, with these destinations offering lower ‘in-destination’ costs, like the other two high-growth destinations of Egypt and Greece. To identify which global events drive Skyscanner users in Europe and the Middle East to travel, we looked at which popular events drove a growth in exits – along with the travel behaviour of individuals travelling to the event. As is evident from the chart below, the event that drove the highest growth in exits* in 2017 was Saint Patrick’s Day, which resulted in 78%+ growth in exits. 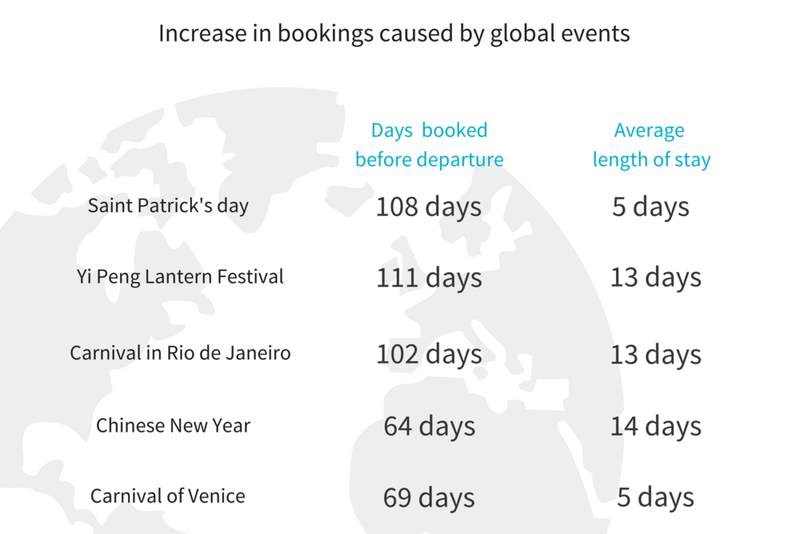 With Skyscanner users in the Americas planning their travel an average of 108 days before their flight and staying an average of 5 days at their destination. The Carnival of Venice, on the other hand, drove just over 12% growth for the festival period*. By analysing the data of Skyscanner users in the EMEA region, we have also identified trends in their search and exit behaviour. For searches, the summer months have the highest volume of searches each month; and Monday is shown as the most popular day of the week to search. Similarly, July is the most popular month to exit on, showing that the summer is the prime time to plan and book travel. The most popular day of the week for exits on the other hand is Tuesday, demonstrating that there is a short gap between the time that users show their interest and take action. 90% of the top 10 destinations are within the EMEA region. Similarly, all the top growth destinations are within this region. Therefore, not only is travel within the region the current preference, but data indicates it will remain this way for years to come. Although travel within the region is more popular on the whole, long-stay holidays are highlighting a preference towards Asia. 3 of the top 10 long-stay destinations are currently within Asia, with Thailand ranking number 2. 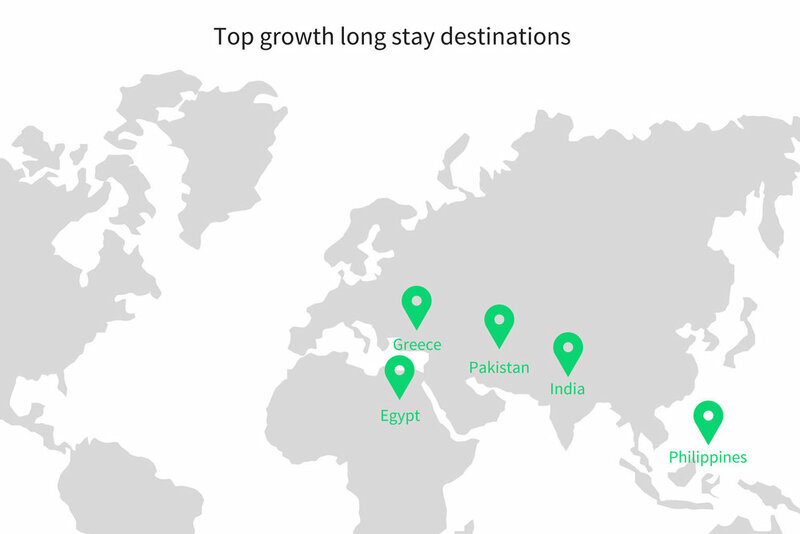 And India, the Philippines and Pakistan are all showing high growth (by exits) for long-stay holidays. The data on our users in Europe and the Middle east has demonstrated that the summer is when users search and exit. Specifically, July through September has the highest search volume per month, and July has the highest exit volume – making it an essential month in the annual travel cycle.